(FASTNEWS|COLOMBO) – Two Federal lawsuits have been filed against the former Defence Secretary Gotabaya Rajapaksa in the United States (US), it is reported. Premier Group International (PGI), an Investigative and Security Corporation based in Southern California stated that its Licensed Process Servers teamed up with Ideal Investigations, Inc., to serve papers for two Federal lawsuits filed in California on Gotabaya, who is a dual US Sri Lankan citizen. Premier Group International (PGI), an Investigative and Security Corporation based in Southern California stated that its Licensed Process Servers teamed up with Ideal Investigations, Inc., to surveil and serve papers for two Federal lawsuits filed in California on Gotabaya, who is a dual US Sri Lankan citizen. One case was filed on behalf of a Tamil torture survivor while the other was filed over the murder of Veteran Journalist Lasantha Wickrematunge. The International Truth and Justice Project (ITJP) and the US Law Firm Hausfeld have filed a civil damages case in California against Gotabaya on behalf of a Tamil torture survivor, while the case against Gotabaya related to the murder of the Veteran Journalist was filed by Lasantha’s daughter Ahimsa Wickrematunge. 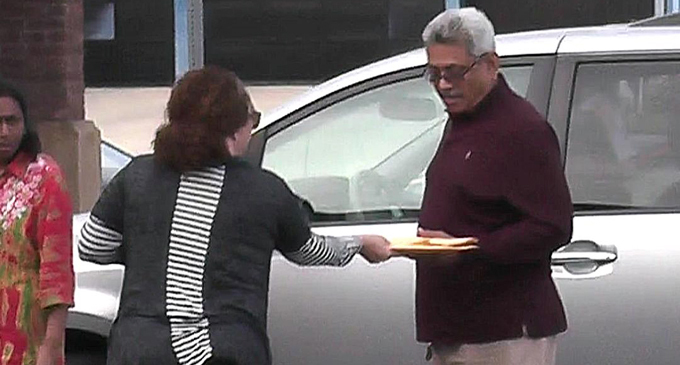 Notice was formally served on Gotabaya on Sunday (07) in Pasadena. Youth falls to his death from hotel building at Galle Face Progress review on steps taken to solve issues at junior levels of Police Dept.